This past year, the Shawnee telecommunicators faced continuous change, a nation-wide staffing shortage, as well as, the evolution of the 9-1-1 industry as more duties were added to their daily tasks. Despite these obstacles, the telecommunicators were able to decrease sick leave use by 37.5%; this is several months of 12 hour shifts without a single person calling in sick for their shift. The telecommunicators worked as a team and assisted in training one another in order to increase quality assurance scores by 10%. Almost 300,000 calls were processed in 2018, and 24,000 of them were 9-1-1 calls. In 2018, telecommunicators of the Shawnee Communications Center were recognized for their actions taken during pursuits, shootings, domestics, medical and fire calls. Even with minimal staffing levels, these ladies and gentlemen managed to meet national standards in answering all 9-1-1 calls. The telecommunicators in the Shawnee Communications Center strive to meet and exceed national standards not only through practice of their skill, but also by regularly attending professional development events, earning continued dispatch education credits, and participating in state and national professional dispatch organizations. The Shawnee Communications Center is responsible for the scene and responder’s safety until someone else arrives to take over. As they maintain the incident, they are also responsible for processing all 9-1-1 and non-emergency calls, monitoring all radio channels, performing administrative duties, and most importantly, providing help to citizens who may be experiencing the worst day of their lives. International certifications have been obtained in an effort to provide CPR instructions, talk someone through child birth, and assist with instructions to escape a burning building or other hazards. 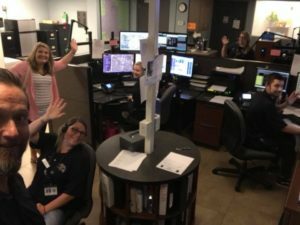 The Shawnee Communications Center is staffed with some of the best telecommunicators in the state and most importantly, they care about every police officer, fireman, and paramedic they converse with on the other end of the radio. The Shawnee Communications Center is the only division within the police department that serves multiple cities and counties with emergency services. Because of their impeccable performance and the high standards they’ve set across the state, the Shawnee telecommunicators of 2018 deserve recognition for their services.